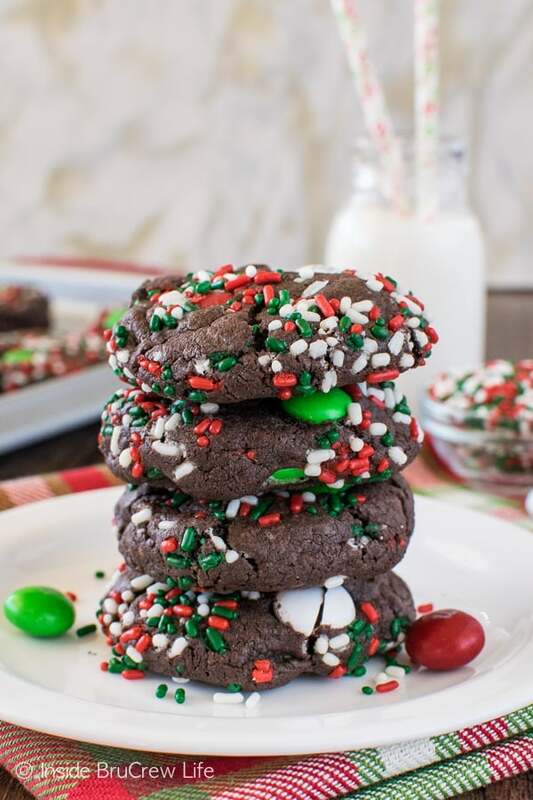 Add these festive Chocolate Mint Pudding Cookies to your holiday cookie trays this month, so that you can watch them disappear. 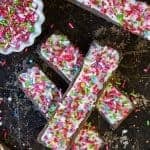 Soft cookies loaded with candies and sprinkles are always a fun treat to share. 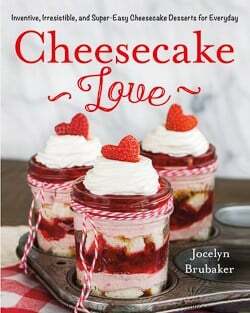 *I am partnering with the Cake Boss Baking site this month to bring you new recipes showcasing their products. 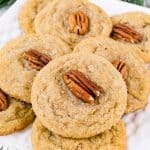 Have you started collecting the cookie recipes that you want to make this month for parties and events? Each year at the beginning of December, I start to compile “the list”. This is a list of cookies, candies, and treats that I want our family to make for the holidays. Usually we try to make about ten different things because we like to package them up and give them to friends and family bring them to parties. 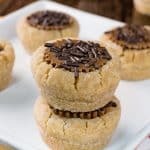 Usually this list consists of recipes that get made year after year since they have become favorites. 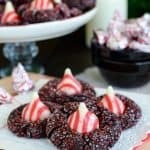 Each year I also choose one or two new recipes to add to the top ten holiday treats of the month. 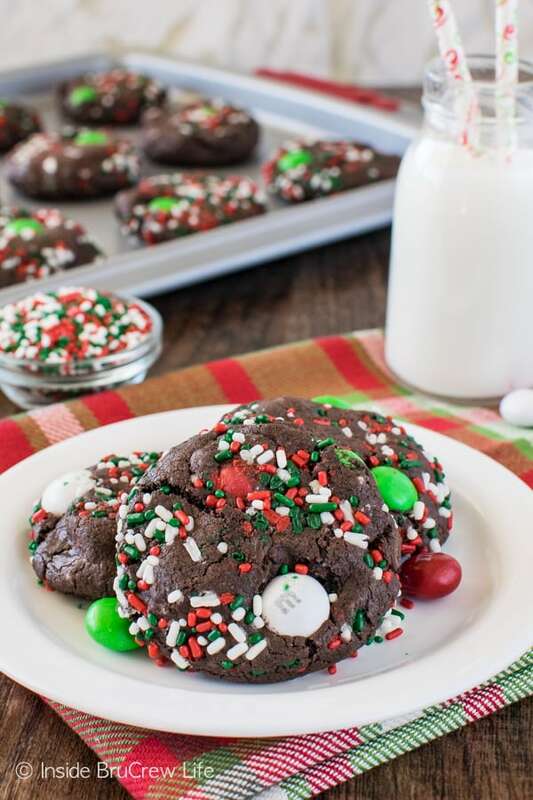 Right now these chocolate mint pudding cookies and these Chocolate Chip Cherry Cookies have jumped to the top of the list as soon as I made them. This month I am partnering with Cake Boss Baking to bring you recipes using some of their baking products. For this recipe I chose this cookie pan and cookie scoop because I knew I would be testing cookies this month. I love the sturdy construction of both items. The cookie sheet has guides embossed on the bottom to help bakers place their cookie dough evenly on the pan. The nonstick coating ensures that your cookies will lift off easier making clean up so much easier. This was the first time I actually used a cookie scoop to portion out my cookie dough, and it had me wondering where it had been all my baking life. I love how much easier it was to scoop even dough balls. It is a definite must have for your kitchen. I’m excited to use it for scooping cupcake batter next. Make sure to set your butter out at least 30 minutes to an hour before you start making the dough because soft butter is much easier to cream with the sugar. Use a spatula to move the butter mixture and dough down from the sides of the bowl as you work. Gently stir the chocolate chips, candies, & some of the sprinkles into the dough. The dough is stiff so be careful not to mash the candies as you stir. 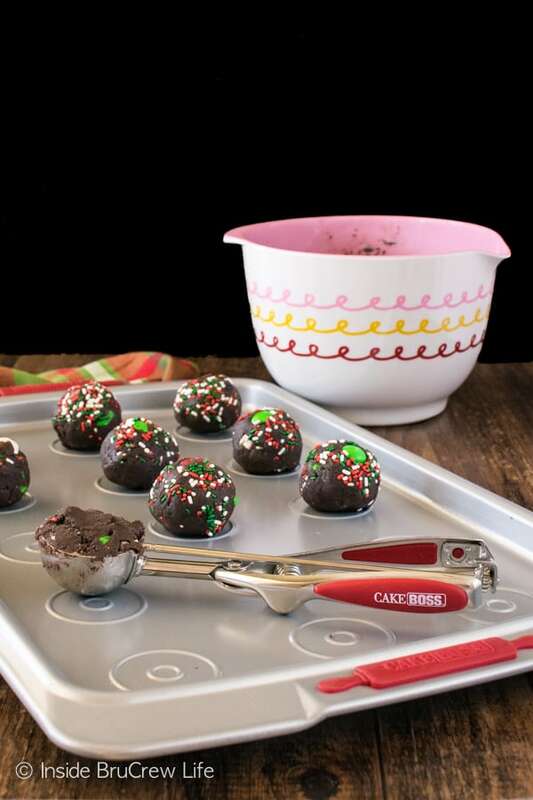 Use a cookie scoop to scoop the dough because even dough balls bake better. Roll each scoop into a round ball before pressing extra candies in the top. Roll the dough ball in the remaining sprinkles too. Bake the cookies. When the cookies come out of the oven use a flat spatula to gently press or tap each cookie to flatten it slightly. Let the cookies cool on the pan for about 2 minutes before moving them to parchment paper on the counter. Keep the cookies in a sealed container because you want them to stay soft for days. Finally, microwave each cooled cookie for about 5-7 seconds if you want to enjoy a hot “fresh” cookie. 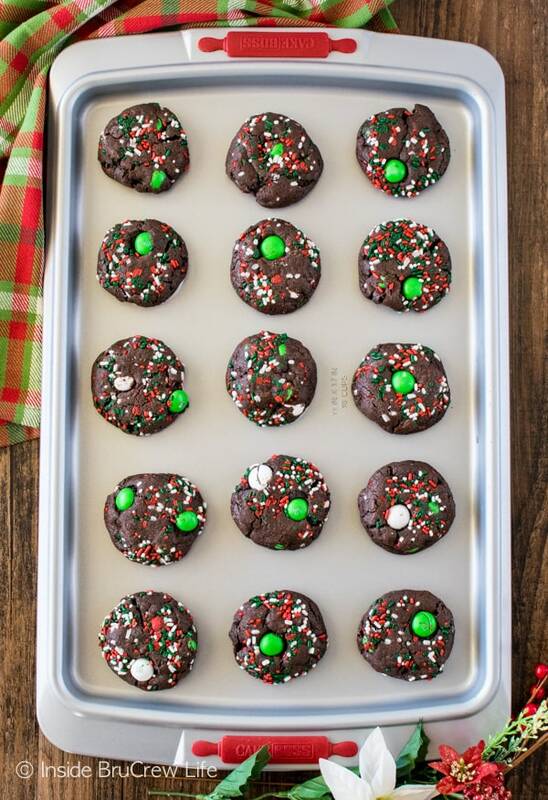 Add these festive Chocolate Mint Pudding Cookies to your holiday cookie trays this month and watch them disappear. 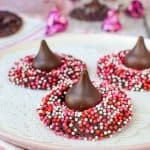 Soft cookies loaded with candies and sprinkles are always a fun treat to share. Beat the butter and sugars until creamy. Add the eggs and extract and beat again. Stir together the pudding mix, flour, cocoa powder, salt, and baking soda. Slowly beat this into the butter mixture. 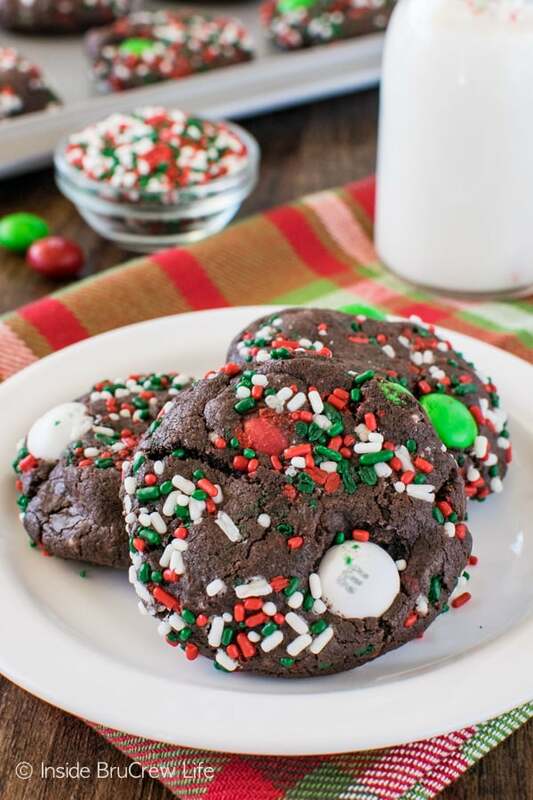 Stir in most of the M&M's, the chocolate chips, and the 2 Tablespoons sprinkles gently. Scoop the cookie dough out into 30 even balls. Roll each one into a ball and roll in the extra sprinkles. Bake for 10 minutes. Remove the pan and let the cookies sit on the pan for 2-3 minutes. Tap the top of the cookies with the bottom of a flat spatula to flatten each cookie slightly before moving them to a piece of parchment on the counter. Let cool completely before storing in a tightly sealed container. 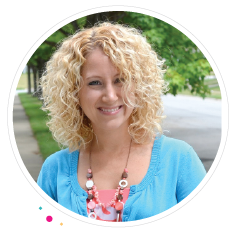 *Inside BruCrew Life was sent product to review and was compensated to create a recipe for the Cake Boss Baking site. As always, all opinions are 100% my own. Thank you for letting us share products and brands that we use and love. Love chocolate and mint such a classic/ fabulous combo! And all the christmas sprinkle, adorable! 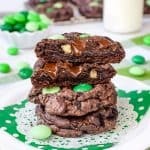 I love chocolate and mint together! And all the Christmas sprinkles look so festive! I can’t believe you just got a cookie scoop! 🙂 Aren’t they just amazing? I have a muffin scoop as well, I adore them all. Once I got the muffin scoop I bought cookie scoops as well. They are super handy. Anyways, love these festive cookies Jocelyn 🙂 Hope you are having a great December. Christmas is almost here! These look great. I love using a scoop for cookie and cupcake batter makes it go so much faster. Thanks for another great recipe. Sorry to be so hit and miss on my comments. These are hella festive!! I love chocolate mint around this time of year! These cookies look to have a perfect texture.